Biomass heating is the generation of heat for a building through the use of organic materials including wood, energy crops or clean industrial and agricultural residues. Heat is produced by a combustion process which can be used to heat water or air. 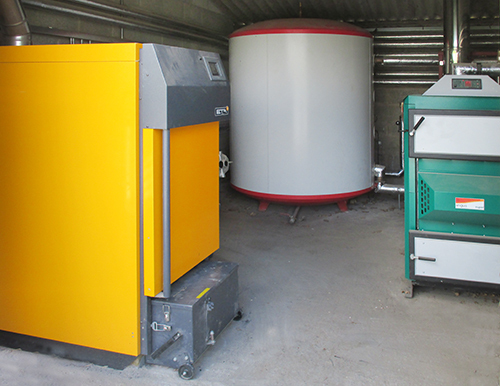 A biomass heating system can range in scale from a small, manually fed system with basic controls, to a fully automated system with advanced controls. Biomass heating is generally considered to be carbon-neutral: although the combustion process releases carbon dioxide, this is countered by the carbon dioxide absorbed in the original growth of the biomass. So a biomass heating system is regarded as a renewable energy source. Compared to a coal-fired system or electric storage heating, a biomass boiler will save on carbon dioxide emissions by anything up to 9.5 tonnes a year. Barkwell Plumbing and Heating is committed to reducing the environmental impact of all the equipment we install and maintain. To this end we have made ourselves fully adaptable to renewable energy technology as new systems are developed. And these systems can be applied across large-scale projects involving hundreds of houses, just as easily as smaller domestic installations. Because we have developed our expertise in all forms of renewable energy systems, we can be sure that the carbon footprint produced by the work we do is kept to an absolute minimum.